Each year the participating institutions (Emory University, Georgia State University, Yerkes National Primate Research Center, and the Marcus Autism Center) recruit researchers willing to host an ION Scholar for mentored hands-on research. These researchers are asked to design an opportunity for the Scholar that includes them in as many aspects of the research process as possible in a 7-week program, e.g. exploration of background literature, experimental design, data collection and analysis, interpretation, presentation, and writing. 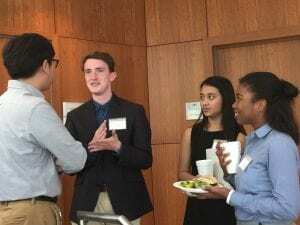 Once final offers have been made for the available summer positions (following application review and in-person interviews), ION Scholars are invited to a Saturday luncheon when they can meet representatives from the labs that have volunteered to host an ION Scholar. The Scholars will hear from each research lab and then have the opportunity to ask representatives questions over lunch. Following the luncheon, Scholars are asked for their top choices for their summer placement. In past years, Scholars have generally been matched with one of their top three choices. Once the matching process is complete, each Scholar will begin the hiring process with their respective institution through the matched institution’s human resources department. Stipends for the research work are generally paid following the completion of the 8-week program.